Rice terraces always become the belle for tourists. 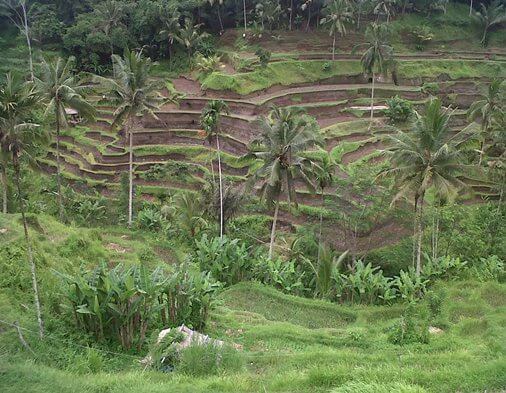 Bali has a lot view of paddy fields, mostly in the form of flat field and only a few are in the form of terracing. Terracing displays more value of art and beauty in growing crops. This value is hunted by painters and photographers to capture the beautiful views of rice terraces with asymmetric horizontal lines. If you are currently at Ubud or has a plan to visit Ubud, then you can try visiting (given its location close enough) Tegalalang Rice Terrace in the District of Tegallalang, Gianyar Regency, Bali. 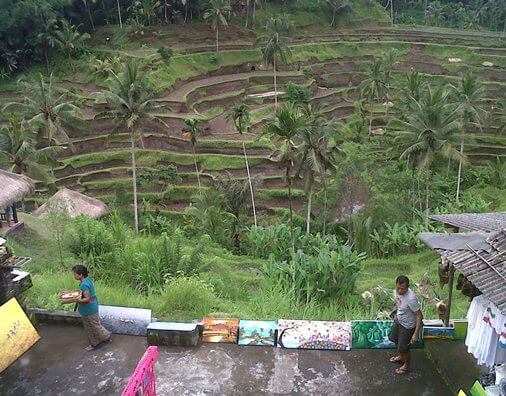 The privilege of Tegalalang rice terrace lies on the sloping side (ravine) and the position of the main road (including the rest area). The farmers are trying to optimize the farming land, so they "cuts the soil" a bit deep (on the slopes side) to get enough flat land, though not too extensive. Because the soil cuts are deep, the distance between the terrace lines will be obvious. In addition, the curve of the terrace line also follows the curve of the ravine and creates a beautiful asymmetrical indentation. The position of the main road (including the rest area) is relatively high compared to the rice terrace. It's provides a perfect view with the distance between the lines and the curves line are beautifully asymmetric. This is in contrast to the rice fields on the vast plains, where the distance between the terrace lines is not clearly visible and has the rice plots form (square or rectangle). In agriculture, a terrace is a piece of sloped side of a hill, mountain, or ravine that had been cut into a flat surface that stratified successively. This type of landscaping is further known as terracing. Terracing has long been known in various countries in the world. It is used to support the growing crops that need irrigation such as rice, wheat, and barley. The terraces were built to make the most efficient use of shallow soil and to enable irrigation of crops (effective farming) also to decrease both of erosion and surface runoff. Terraced rice fields are used widely in the East, South and Southeast Asia (as well as other places). In Southeast Asia especially in Indonesia, rice is a staple food for all classes and holds the central place in Indonesian culture and Indonesian cuisine. The importance of rice in Indonesian culture is demonstrated through the reverence of Dewi Sri. Dewi Sri is the traditional rice goddess of the Javanese, Sundanese, and Balinese. Most rituals involving Dewi Sri are associated with the mythical origin attributed to the rice plant, the staple food of the region. The location of Tegalalang rice terrace is so strategic and become rest area for tourists to enjoy the view of the rice terrace which managed by Subak. In Bali, the traditional Subak irrigation management was created to ensure the water supplies for rice paddies. It is managed under the authority of the priests around the water temples. For the Balinese, irrigation is not simply providing water for the plant's roots (paddies), but the water is used to construct a complex and active artificial ecosystem. Subak system has been established by the UNESCO World Heritage Center (in Cultural Category) as The Cultural Landscape of Bali Province. In addition to the terracing which are startlingly beautiful, visitors can also buy their souvenirs. Various types of souvenirs sold along this main road include paintings, crafts, animal sculptures (duck, cat, giraffe, etc. ), bags, stone carvings, masks, etc. Visitors can enjoy the dish menu or drinks while relaxing at the restaurant and enjoying the beautiful rice terraces.